Study with NYTT faculty at home, at your pace. Yogis across the centuries have harnessed the power of sound to fuel their yoga practice.Traditionally chanting and deep listening held a central role in yogic practice in India. When yoga migrated to the west the physical practice of asana was emphasized and the place of nada anusandhana (yogic sound practice) faded into the background. 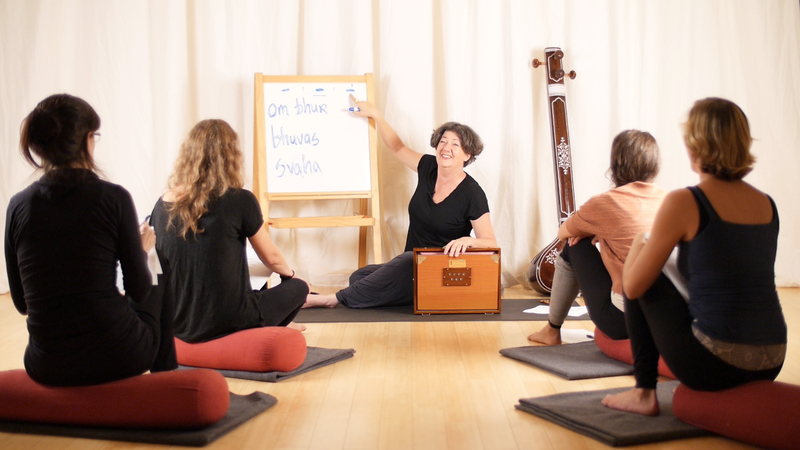 In recent years, however, there has been a resurgence in yogic chant in studios across the country for its reputation as the simple, quick, easy yogic path. Yoga can be a powerful expression and exploration of the feminine, yin aspect of being. The cyclical nature of women’s lives reminds us to reconnect with the natural world; in honoring our cycles, we tap into a deeper understanding of planetary awareness. Explore unique ways to tailor the practice of Yoga to women’s physiology and the varying stages of a women’s life. Included in this course are active and passive yoga, pranayama, meditation, Ayurveda practices. We will reflect on how these ancient practices can be used as a refuge for women today and support us in leading engaged, connected and compassionate lives.